Are We Rounding The Rally Corner? As I previously touched on, we had a 90-90 down day on Jan. 4th 2008. According to the Lowry’s study, all we need now is a 90-90 up day for a market bottom. Today wasn’t it. Although the market went up, it did so lethargically. Volume did flow in the right direction: advancing stocks in the NYSE were 1,003,680,000 compared to 401,066,000 declining stocks - a 5:2 ratio. And on the Nasdaq, almost 3:1. But we need much more excitement than that to forge an inflection point. 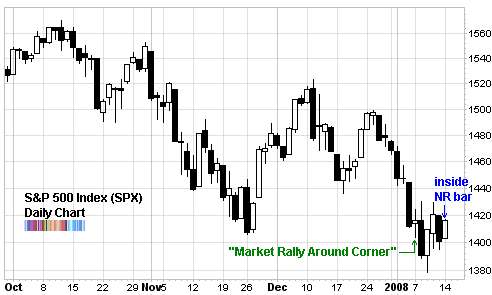 And although we still haven’t taken out those lows, the market is coiling into a tight range. If it reacts to the recent oversold conditions and breaks out, then the probability of it continuing and regaining lost ground is high. But it can also break down to retest the lows. Or even go lower. The market is. No one can predict or control it. I’ve shared a thesis of where things may be, but I’ll let the market prove me wrong or right. Right now, by several measures, bonds are expensive and stocks are cheap. I’ll go into this point more in depth in a few days. What matters though is that this important relationship is skewed towards a rally. But this is a myopic market. The only thing it can focus on is what is immediately in front of it. Which happens to be Tuesday’s expected announcement from Citigroup (C). Being the market tell for the day, I’d suggest keeping a watchful eye on Citi. One observation in favor of increasing SP 500 index. I think you’re misreading the market, the trend is (has) changing. We won’t see a sustained rally until we burn off the liquidity and internal market problems related to subprime and debt. The Fed is throwing money at the problem but its not working. The US consumer is finally tapped out and when they don’t spend, well you know the rest. I’ve been in mostly cash and bonds since mid December ‘07 and on days like this I’m glad I’m out. Tom, other than the fundamental issues that you mention (and everyone already knows about) why exactly do you think the major trend has changed? Mind you, I’m not saying you’re wrong. I don’t know that. I’m just curious about your thinking process. Right now fundamentals are driving the game and, in my opinion, overshadowing the technical analysis. On a weekly chart, the S&P500 sure looks likes like its starting a pattern of higher lows and lower lows. Sure things look undervalued right now but are you buying? Really, are you buying?